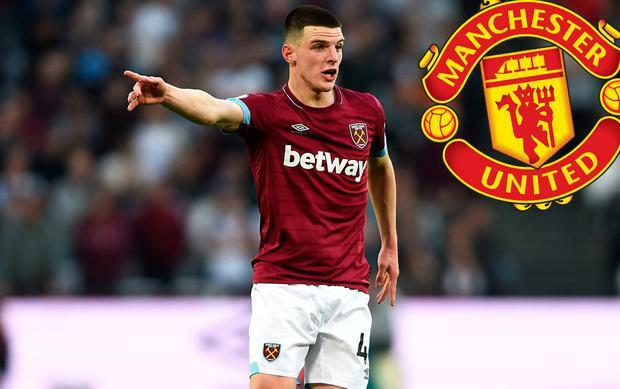 MANCHESTER UNITED are ready to break the bank to sign West Ham youngster Declan Rice this summer. It is understood that Rice's advisers are fully aware of United's eagerness to sign the 20-year-old midfielder, who switched his international allegiances from the Republic of Ireland to England last month. Rice signed a new contract that ties him to West Ham until 2024, but his £30,000-a-week salary will be dwarfed by the offer United could put before him. West Ham boss Manuel Pellegrini admitted his club may be forced to sell if a "big team pay an important amount of money" to sign the Hammers academy graduate. Now West Ham officials are braced for a bid for Rice, with a fee in excess of £50m likely to be demanded for a player who has played just 56 Premier League games. Borussia Dortmund's Jadon Sancho and Rice are on a list of transfer targets compiled by United manager Ole Gunnar Juan Mata, Ander Herrera, Antonio Valencia and Marcos Rojo are all expected to leave United this summer, with Nemanja Matic's future in doubt if Rice arrives. The plans mark a clear change of transfer policy from United chiefs, who have focused on signing expensive and proven performers in recent years as the like of Paul Pogba, Nemanja Matic and Romelu Lukaku have arrived in big-money transfers. With former United manager Alex Ferguson believed to have increased influence following the arrival of his former student Solskjaer and the return of his old assistant manager Mike Phelan to the first team coaching set-up, United are now eager to return to a tried and tested formula in the transfer market. That involves signing the best young players in the world and developing a strategy for long-term success, rather than fixating on quick-fix and expensive solutions as Solskjaer prepares for his first summer transfer window as United manager. In the opinion of United legend Rio Ferdinand, his old team-mate Solskjaer will follow a different path compared to Louis van Gaal and Jose Mourinho when he makes his transfer picks. "What United used to do better than anyone else was identify the best young players out there and use the pulling power of the club to get those players in," BT Sport pundit Rio Ferdinand told Independent.ie. "We had a young Pogba, a young Gerard Pique and players of that calibre at the club not so long ago, but the transfer policy has changed in the last few years and it has not always worked. "Big money transfers are good in some respects and the fans get excited, but Ole will want to work with young players and make sure they understand what it means to be a Manchester United player. "Every player who walks through the door at United needs to have a certain DNA and too many have been signed by the club in recent years that lack those qualities. "It said a lot to me that in his first transfer window as United manager, Ole didn't waste any time getting rid of Marouane Fellaini. That was his decision and it was clear to me that he felt he had a player there who didn't have the United DNA. "It's not just talent, it’s much more than that. Are you good enough to be a United player, do you want it enough, do you understand what it means to wear the shirt and represent the club. "I remember Bobby Charlton coming into our dressing room a lot when I first went to United and that was a reminder of what this club is all about, but we have not seen enough of those qualities in the last few years and maybe now that will change with Ole. "When I was at United and a new player arrived, we all eyed him up and assessed whether he was good enough to play for the club. You have to expect that scrutiny when you are at a big club and there is no bigger club than United."